Hello crafters! 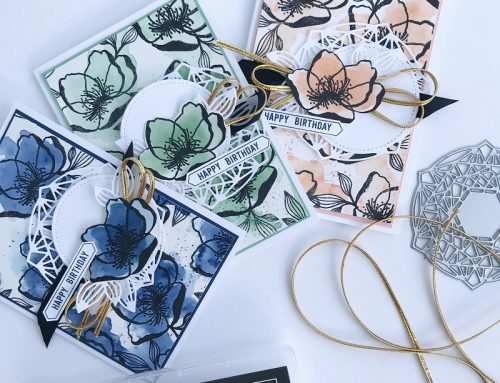 I’m Kimberly, a Stampin’ Up! Demonstrator from Florida. Here in Florida the flowers are starting to bloom and you can see the beginning of spring. I’m excited to share a fun spring project I created for my friends who helped me with a recent conference using the Succulent Garden Suite from Stampin’ Up! Succulents are so popular and a perfect gift to give friends because they are easy to care for. Being the crafty person I am, I wanted to spruce up the succulents I purchased and create a banner & card combination my friends could remember our time spent together. The Oh So Succulent photopolymer stamp set and Succulent Framelits Dies were the perfect combination to complete my project. To create the banners for the succulents, I used the Banners Framelits along with the All Things Thanks stamp set. To keep with a natural look for the banner, I used Kraft Cardstock. The greeting was stamped using Basic Black Archival Stampin’ Pad. Die cut two banners and place a wooden dowel between the banners using hot glue to keep them together. You will notice a small piece of Delicate White Doily between the banners. I’m a huge fan of doilies and how they add a delicate look to any project. The flowers were stamped and then die cut using the Succulent Framelits Dies. Each stamped flower was simply layered around the greeting and attached to the banner using Tombow Multipurpose Liquid Glue. I kept the same color schemes when creating the greeting cards. I used the largest circle die cut from the Stitched Shapes Framelits and die cut from Watercolor Paper. I added a watercolor wash over the Watercolor paper using Sweet Sugarplum Classic Stampin’ Pad and an Aqua Painter. The greeting was stamped, although I omitted a portion of the words so only the “thanks” was seen. This was done simply by layering a few pieces of the Succulent Garden Designer Series Paper across the circle die cut. I also used a piece of the designer series paper along the left edge of the card. I love how this beautiful paper made the colors pop from the stamped flowers. All of the flowers were stamped onto Stampin’ Up!’s smooth Whisper White cardstock. The following colors were used to stamp the beautiful flowers using Stampin’ Up! Classic Ink Pads: Sweet Sugarplum, Mint Macaron, Calypso Coral, Old Olive, and Rich Razzleberry. My last card was created using Stampin’ Up! Whisper White Notecards. Notecards are perfect to use for a more simplistic card. I kept the color scheme the same, only changing out the thank you greeting. I hope you have enjoyed my projects today. There is one thing we know for sure, creating a fun project for a friend is a great way to let them know they are loved! Thank you Kimberly for joining us again and for sharing these sweet projects! And we completely agree, what a lovely way to let a friend know you're thinking of them! We're thrilled that our friends at Stampin' Up! have offered the Oh So Succulent Photopolymer Bundle to one lucky reader! For an opportunity to win, be sure to leave a comment below by March 28th! Congratulations Judy! 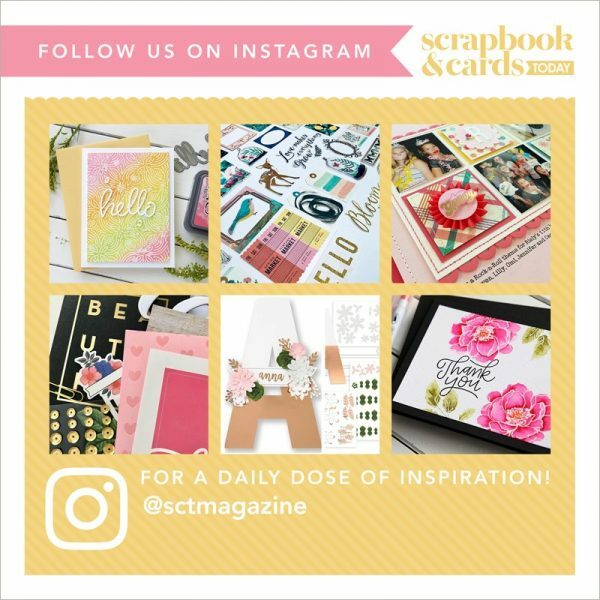 Please send your address and telephone number to us at ideas@scrapbookandcards.com and we'll send if off to Stampin' Up! Please put "Stampin' Up! winner" in your reference line. Thank you for joining us today and sharing Kimberly's beautiful projects! Enjoy the rest of your Saturday! What a wonderful and diverse set of stamps and dies! I love the banner! The colours used are fantastic. Thanks for sharing and inspiring! So gorgeous! I love the little plant pick! Have a 70th birthday coming up soon and hope this will be one of my gifts. Your cards are just amazing…nice to see flowers in the winter!!! 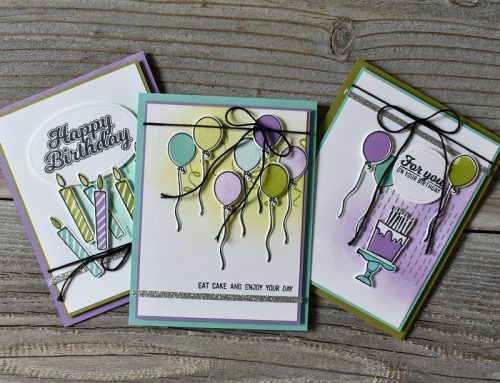 What a versatile stamping and die set, thanks for sharing all of the different applications. These stamps and framelits are a wonderful combination and I love all the beautiful projects. It would be great to win this awesome prize! Beaytiful cards! Thanks for sharing. A great stamp and die set. 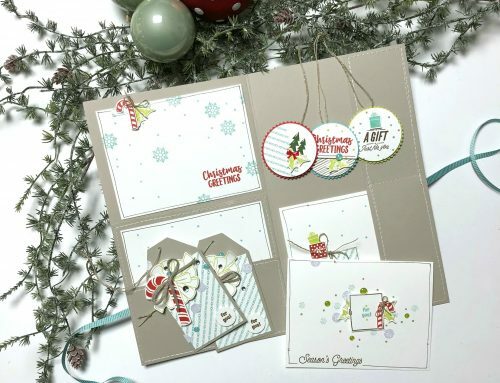 Love the original cards designed using this wonderful set from Stampin Up!! Love, Love and Love your creations and this set! Thanks for sharing with us!!! Such fun cards! love this set! Thanks for the chance! Wow! Beautiful cards! I love to use floral images on my cards. This set looks like a fun way to build your floral images. Thanks Limberly for all the inspiration! I love this set. Today’s projects are beautiful. What a beautiful succulent stamp and die set. Just love the cards made with this but my fav is the plant picks. What a great idea! I so love plants of all kinds. Your Succulent samples are a breath of Spring air on this cold, windy night. The colors are perfect for spring and the flowers look so pretty. What a great stamp and die set. This Oh So Succulent set by Stampin’ Up is beautiful and so creative. Love the cards too! Great cards. Thanks for the opportunity to win the set. it in the plant as an embellishment. Thanks for sharing these wonderful projects and the chance to win. Love love love these cards! They are so very pretty! I love succulents! And that DSP along the side of the card is absolutely gorgeous. Wow! Love SU! Thanks for the chance! So pretty, looks fabulous in the plant pot too! Gorgeous projects that are screaming spring to me! How I would love to win this set. Love that it has both solid stamps and outline stamps, giving you the option to do some hand colouring as well. And dies, too! I hardly ever buy accompanying dies with my stamps to save money, but I can see how having the dies would make it so much easier to create beautiful flower arrangements. Thanks for the chance to win! What a lovely way to personalise the potplants! Terrific bundle. I love the flower accent in the plant. Can’t get enough of floral bundles–good for many home decor, card making, and scrapping. 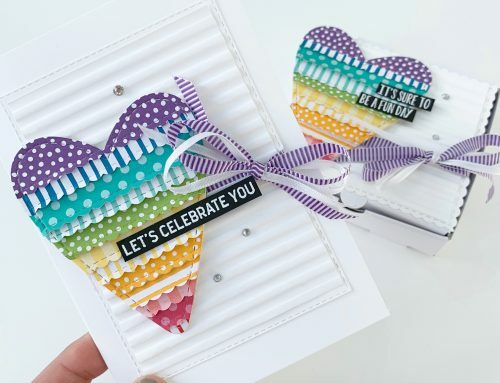 Your cards are gorgeous Kimberley! And that stamp/die set is so nice! I love the banner for the succulents. I adore gardening so this “Oh So Succulent bundle set by Stampin’ Up” would be a perfect addition to my stamp collection! Thanks so much for sharing and the chance to win this great giveaway! Pick me! I love this stamp set. It includes the little details to add on when stamping with flowers. Love the sentiments as well. Stampin’ Up! has great products. I especially love the quality of their card stock. I don’t have much of a green thumb, so succulents work for me! What fun it would be to use the Oh So Succulent set in my crafting! Lovely combo pack. Thanks for the chance to win. Great samples and tons of inspiration. WOW beautiful cards. This set looks awesome and the fact that it includes the matching dies….well what can I say. Perfect!!! Would love this set and thank you for the opportunity to win. The Oh So Succulent bundle is gorgeous! Love all the projects…helping me turn my thoughts to spring flowers. Great springtime bundle! It’s time for some flower projects! Thanks for the chance to win! Cute! Thanks for the opportunity to win. What fun projects! I love the picks for the sweet little succulent pots. Stunningly beautiful cards!! Thanks for the chance! These cards are so pretty! Very well done! I love Stampin Up too! I just love succulents, and they are just about the only plant I can manage to keep alive…so there’s that a bonus! 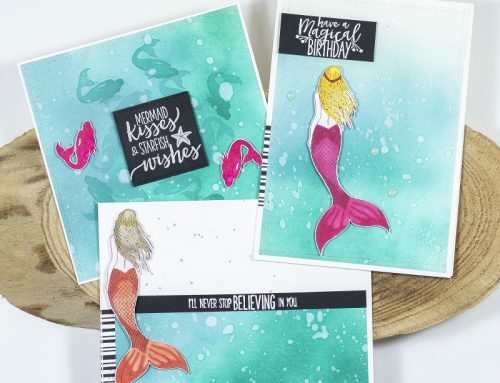 Being able to make die cut and stamped ones would be even better….and I love Stampin Up products. These stamps are so pretty and I love the cute plant decorations. Succulents are all the rage right now, and I would love to win this fun Stampin Up set! Wow!!!! Beautiful projects!!! Love this set!!! Congrats Judy on your win!!! what a gorgeous set–those projects are beautiful! This project is fabulous! I think that succulent set and the matching dies are really darling! This succulent set is amazing, but so many of Stampin’Ups products are! Your bright colors are so energizing. The projects you thought up were very cute and creative. This new bundle from Stampin Up is a great way to brighten someone’s day as well as celebrate the upcoming spring season!! Thanks for the chance to win! I love the idea of creating a planter pick for the plants, using the So Succulent set. The Framelits are perfect for 3D gifts and effects. Thanks for the chance to win! Succulents are all the rage right now. They were used in my daughter and daughter-in-law wedding bouquets. What a perfect addition to add to their photo albums. Certainly on my bucket list. Great job on all the beautiful projects. Love the idea of creating a coordinating succulent banner when giving a gift of succulents. Adorable. What a nice way to dress up a plant with the banners, especially when giving a plant as a gift. I love the card ideas, very springy. Also would make a very nice Mother’s Day card. Thank you for sharing your ideas. Thanks for giving us a chance to win a set. Love the Succulent stamps. Great inspiration for spring! The set is beautiful…. Plants that will survive my “not so green thumb”!!!!! LOL…. The colour combinations are very pretty too. A sign of spring! Thanks for the chance to win this awesome set. Good luck to all! I’m loving these super cute projects, what a great gift idea, thanks for sharing and the change to win. Love to start thinking SPRING after the dreariness of winter. The colours are awesome. And I had never thought of using some of the patterned yardstick or washi tape to cover up part of a greeting that you did not want (easier than using post-its on the stamp). It’s a great day when we learn something new! What beautiful cards! Love the colors and the doily adds such a special touch. Thanks Stampin’ Up and SCT for such great ideas/prizes. Such an awesome bundle! Love this stamp set and the coordinating dies! Fabulous projects! What a fabulous giveaway! And the projects are beautiful! Thanks for the chance to win this great gift. So love love this set! So many ideas on Pinterest. Your cards are awesome! Wow so pretty! Love this idea thanks for posting it ! Love this die and stamp set. Spring is in the air. My gramma turns 99 today and I am always bringing flowers to her. What a beautiful banner to put with them. She so loved her own flower garden at her own home this certainly would brighten her day too. Beautiful work. Kimberly’s projects are always so beautiful. I especially liked the banners in the plants – great idea! Stampin Up! makes such lovely product combinations! Such a cute bundle, with so many possibilities! Thanks for the chance to win!